88,643 people packed into Wembley to see history in the making. Man City was either going to step out of the shadow of their more successful neighbor or remain the sleeping giant of English football. Stoke on the other hand had more modest ambitions going into this match they were competing in their first FA cup final for their first FA Cup final. Man City lined up with a 4-2-3-1 shape. Which saw Hart ingoal, two centerbacks Kompany and Lescott, 2 attacking fullbacks Richards and Kolarov, 2 holding midfielders with De Jong being the more combative of the two; winning 8/11 duels he was involved in. Barry the other holding midfielder only won 3/8 duels but he did play more passes whilst he was on the field; he completed 40 out of 45 passes in the 73 minutes he was on, whilst De Jong 43/48 passes in his 94 minutes on the field. The attacking 3 was composed of Balotelli, Toure, and Silva. 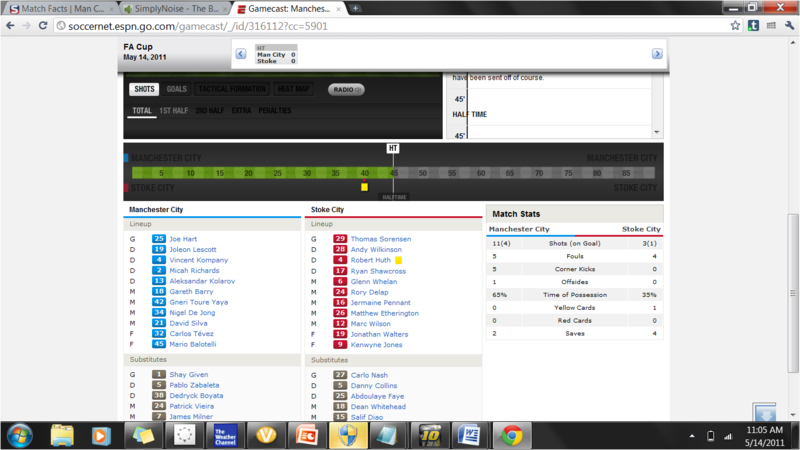 Tevez lead the line as a false 9 drifting in front of Stoke’s backline. City’s attack was not static at all. When Silva drifted wide Tevez moved in the middle as a striker and Toure would stay in the middle as an attacking midfielder. When Tevez drifted wide Silva would move centrally into the box. When Kolarov or somebody moved to the left flank Boatelli would on que move straight into a central position. Richard pushed forward to provide width down the right when Barry stayed back. If Barry moved to the right Richards would stay back helping to cover defensive space. 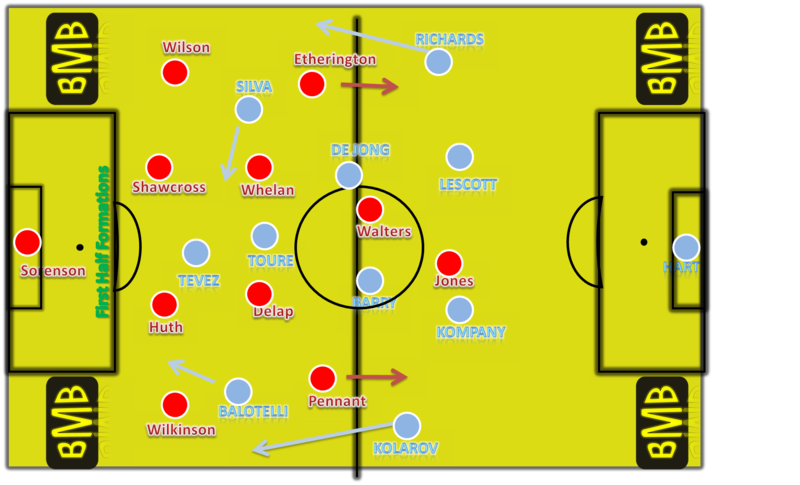 City’s 4-2-3-1 was very fluid and players moved and covered space very well. For the majority of the first half Stoke were left defending. They set up with two blocks of 4 whilst defending. When they did attack they did so with their front 4; which consisted of their two strikers Jones and Walters and their two wingers Etherington and Pennant. Whilst attacking they left 3 at the back and 3 men in midfield who were ready drop back and help Stoke defend quickly if they lost the ball. In the first half Stoke tried to attack quickly off the transition but were unsuccessful in doing so. They also tried to exploit the fact that they are one of the tallest teams in the Premier League. Despite having less possession they out crossed City 10 crosses to 16 crosses by the end of the match. By the end of the first half City dominated possession ending up with an impressive 65% of possession. In total they took 11 shots whilst Stoke took 3. As a result of their dominance they won the corner count 5 to 0 by half time. One of the main reasons for City’s overbearing dominance over Stoke was actually down to Stoke’s tactics! They never pressed City high up the pitch or even near the half way line. They opted to drop deep and defend in numbers as soon as City won the ball. By doing this they submissively let City win the midfield battle. City’s defensive line was allowed to push up to the half way line and on the few occasions City lost the ball they pressed high. City passed well with no player misplacing more than 9 passes through the duration of the match. Stoke were effectively trapped in their half during the first half. Another major reason for City’s dominance was down to Stoke’s passing. 5 out of Stoke’s 10 outfield players misplaced more passes than they completed. 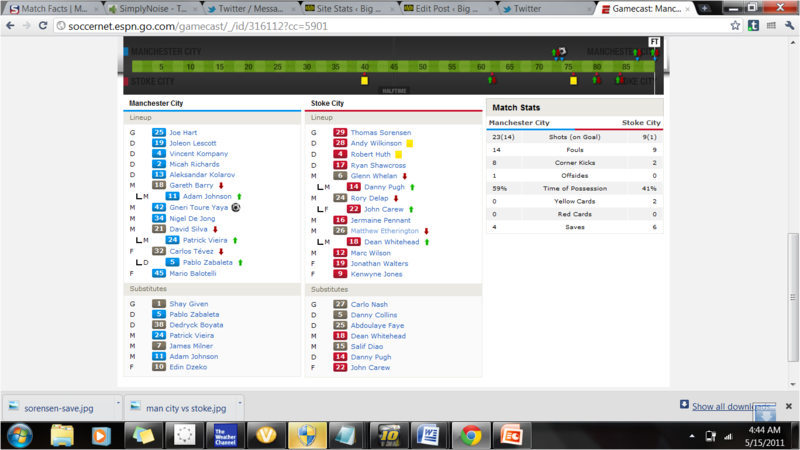 @OptaJoe 3 of those players Wilkson, Huth, and Shawcross were from Stoke’s backline. Failing to keep the ball from the back was Stoke’s major down fall possession wise. Although Man City dominated the game Stoke didn’t role over for them. They defended well forcing city to take 4 out of their 9 shots in the first half outside the box. Sorensen saved all of City’s shots on goal in the first half (4) and by the end of the match Stoke won more duels attempted across the pitch. The introduction of the second half saw both teams play with increased attack impetus. Stoke attacked more in the first 25 of the second half than they did the entire first half. They took 5 shots with 2 in the box, opposed to the 3 shots taken in the first half with 1 on in the box in. Man City also attacked more during this period taking 3 more shots than in the first 25 of the first half. Also they attacked better in this period with 5 shots on target opposed to the 2 in the first 25 minutes of the first half. Sometimes the smallest details make the big difference. Brining Johnson on for Barry in the 73rd minute wasn’t a massive change. Toure just took on De Jong’s role in the first half going forward and taking shots outside the box and De Jong took Barry’s role sitting back more, but the difference was big. Toure played this center midfield role a lot better. In this role he holds the advantage over De Jong; he has more attacking impetus and is technically superior to the Dutch man. As a result he took advantage of a similar opportunity that De Jong squandered early on in the 9th minute. The game was essentially over with Yaya Toure 74th minute goal. Stoke pushed more men forward but it was useless; they were unable to build attacks and keep the ball. They looked more likely to concede of a counter than they did to score. They ended the game with 41% of the possession, 1 shot on goal, and 2 corners. Their inability to keep the ball and their way ward shooting was their down fall on the day. 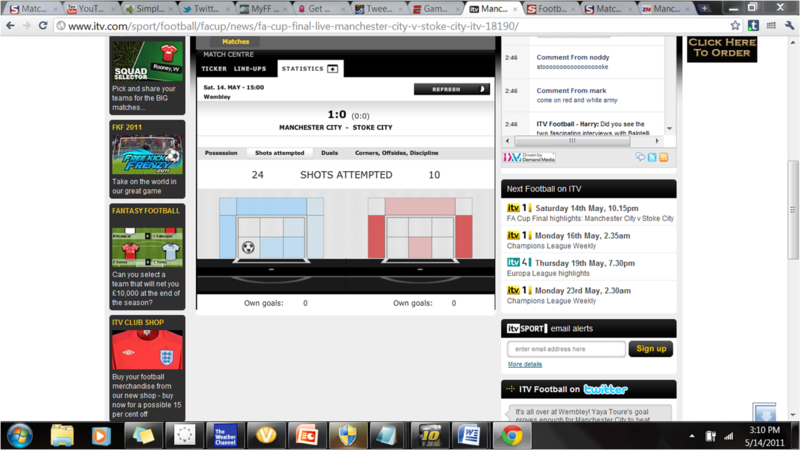 Statistically it shouldn’t be a surprise that Man city won. They ended the game with 59% of the possession, 23 shots on goal, with more than half on target (14). Mancini’ made few tactical changes in the second half to get the win. Brining on Johnson who stayed wide unlike Silva and tested the Stoke left back for Barry was a smart move. It meant that Silva was allowed to move central where he wanted to be anyway and City gained a technically more skilled player in center mid. Even though Toure was stationed in the same position as De Jong central midfield he pushed forward and was more of a threat than his counterpart. Hi. I am a 16 year old aspiring coach with the ambition of becoming the greatest manager ever.